Cuckoo bee photo gallery 2010. Cuckoo bee photo gallery 2011. 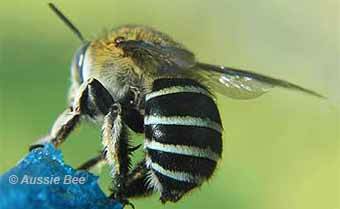 The Thyreus Cuckoo Bees are stunningly beautiful but these bees lead a life of deceit! They behave like cuckoo birds -- laying their eggs in the nests of other bees. 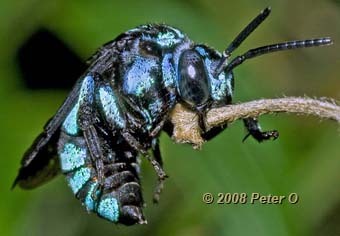 The Neon Cuckoo Bee, Thyreus nitidulus, with glittering metallic blue spots, lays its eggs in the nests of Blue Banded Bees. 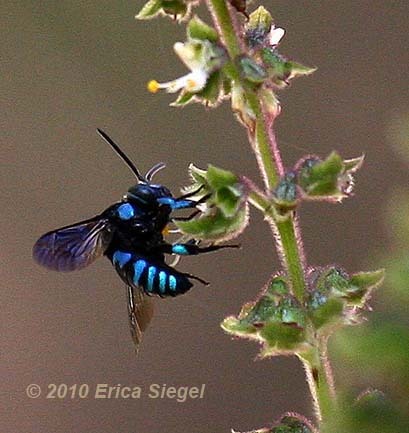 Above: Erica Siegel's fabulous photo of a Neon Cuckoo Bee (Thyreus nitidulus). 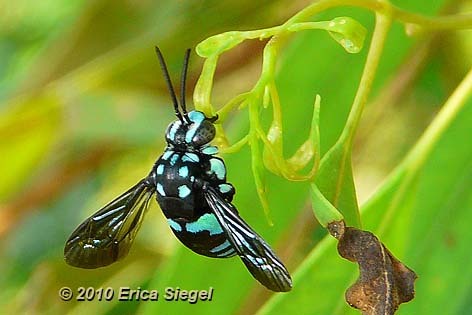 Above: the Neon Cuckoo Bee (Thyreus nitidulus) has dazzling patches of jewel-like blue fur on its black body. 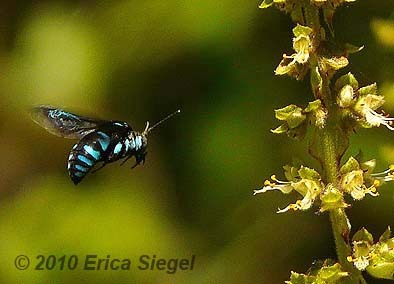 More stunning photos of cuckoo bees by Erica Siegel. A closely related Cuckoo Bee with white patches of fur, the Domino Cuckoo Bee, Thyreus lugubris, preys on the nests of Teddy Bear Bees. Above: A striking Domino Cuckoo Bee, photographed by Aussie Bee. 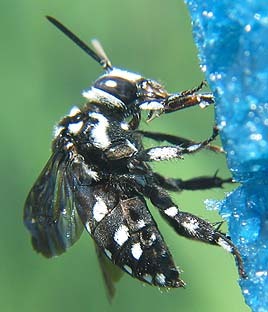 The Thyreus Cuckoo Bees are about 10-13 mm long and belong to the family Apidae. They are found Australia-wide, except in Tasmania.